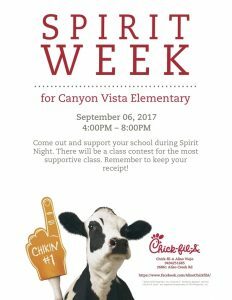 Dine out and support Canyon Vista with RESTAURANT NIGHTS!! Restaurant Nights is a great way to raise funds – and avoid having to cook and clean at home! Win… win! Select locations within our community give back to the PTA for every meal during noted times. Please visit our events calendar or this page for the most up to date information on a great program that supports the PTA funded programs at Canyon Vista Elementary. Please join us for the next Canyon Vista restaurant night event this weekend September 23 and 24th at Fresh Brothers. Fresh Brothers will donate 20% back of all meals purchased by Canyon Vista families. Please make sure to mention to the cashier that this is for Canyon Vista so that they put the receipt in Canyon Vista’s bowl and not the other schools! Our first restaurant night is September 6th at Chick-fil-A from 4:00 PM to 8:00 PM. Restaurant night is a great way to earn money for Canyon Vista’s PTA which funds important programs at our school, including music, art and the science lab. Simply dine in, drive through or carry out during the times listed above and show the flyer attached below. Canyon Vista will receive 20% back of all meals purchased! Keep your receipt from your purchase and bring it to your teacher the next day — the class that has the most participation in the restaurant night will receive a free Chick-fil-A happy meal for each student in the class! 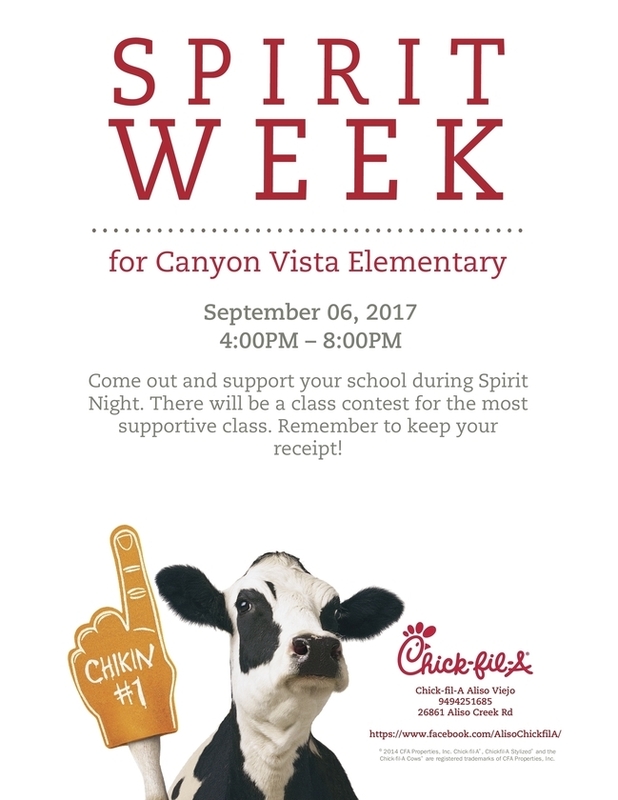 So no need to cook September 6th, come on out for some Chick-fil-A, earn money to help fund the important programs at our school and hang out with your Canyon Vista community! Hope to see you all there!